My name is Thomas and in December 2011 I was diagnosed with Crohn’s Disease, which is a type of Inflammatory Bowel Disease (IBD). Like everyone who is diagnosed with a chronic illness it hit me pretty hard, especially as I had to have part of my bowel removed to reduce the symptoms. To get my head around my new way of life, I tried to learn as much as I could about the condition but the more I read, the more I got depressed by the negativity surrounding it. This made me think that everything I wanted to do before being diagnosed was no longer possible. Once my health became more stable, I decided to challenge my negativity by developing an alter ego called The Chronic Adventurer, a person who goes on adventures BECAUSE he has Crohn’s Disease. By this I am not dismissing the limitations IBD can have on someone’s life, however while I am feeling healthy I want to live my life to the fullest as I know my circumstances could change in the future. 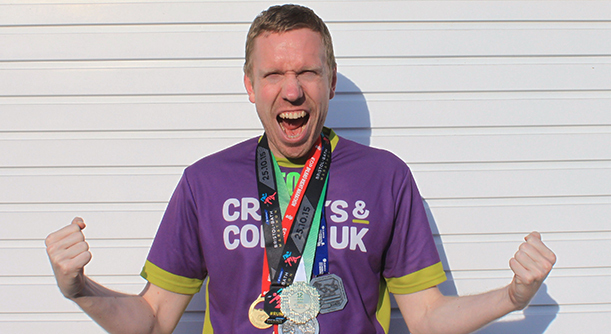 My most recent adventure has seen me run six marathons in 12 months, including the London Marathon. Originally, I only set out to run one but as my health fluctuated in that period, whenever it settled down and I had the opportunity to run just one more marathon, I said YES; again and again and again as I told myself that saying NO was not an option. I also like to share my story online through my blog, Facebook, Twitter and Instagram pages to help raise awareness of my condition and fundraise for the charity Crohn’s & Colitis UK, as well as inspire other people like me. One of my first adventures was on 19th May 2013 when I decided to cycle 80 miles around London to mark World IBD Day. Since then, I have committed to doing something bigger each year to push myself out of my comfort zone and raise awareness at the same time. In 2014, I was filmed as part of a Living with IBD project by Crohn’s and Colitis UK at a time when I still wasn’t 100% comfortable publicly attaching myself to Crohn’s Disease. Last year, I went one step further by joining the Get Your Belly Out campaign and shared a picture of the scar on my stomach across social media to increase awareness of the affects of having Crohn’s Disease. This year, I will be celebrating in Strasbourg as I am representing the EPF Youth group at the European Youth Event. During my transit in Paris, I will attempt to take a photo in front of the Eiffel Tower wearing my Crohn’s and Colitis UK t-shirt. Once in Strasburg, my friends and fellow delegates will join me in wearing something purple for a group picture as part of the European Federation of Crohn’s and Ulcerative Colitis Associations’ (EFCCA) United We Stand 2016 global campaign, which encourages anyone impacted by IBD to unite under the purple colours of World IBD Day.